Patients return the morning after cataract surgery for their first follow-up appointment, which generally takes less than an hour. Additional follow-up appointments typically take place 1-2 weeks after surgery. At this point, most patients see their optometrist to be measured for glasses and obtain an updated eyeglass prescription. We schedule most patients to return to see us 2-3 months after surgery to follow up on how well the eye is doing. However, it is important to remember that each patient heals differently, so follow-up appointment timelines may vary patient to patient. “Patients are always asked to reach out to us with any questions or concerns that they have and we have a very low threshold to bring them in for a follow-up appointment,” says Pevear. However, many eye concerns aren’t accompanied by noticeable symptoms, which is why regularly scheduled follow-up appointments are so important. The short answer is no. Your cataract will not grow back after surgery. There is, however, a thin membrane left behind following surgery. “Leaving this membrane in place when we do surgery gives us greater lens options and allows us to more closely customize vision options for patients,” explains Pevear. What some patients experience weeks or months following cataract surgery is the clouding of this membrane. 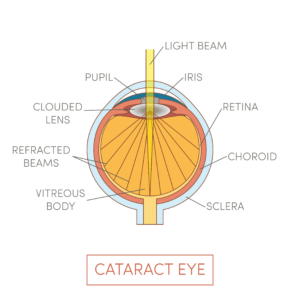 This is often misconstrued as the regrowth of the cataract itself when, in fact, it’s a perfectly normal part of the healing process. “If this occurs we perform a quick procedure that polishes this membrane away,” says Pevear. This simple outpatient procedure is called a Yag Capsulotomy and is performed by a Yag Laser at an outpatient surgical center. The Anne Arundel Eye Center (AAEC) is a regional leader in the diagnosis and treatment of glaucoma and cataracts. A consultation with board certified ophthalmologist Dr. Samuel Boles will guide you through the treatment process and help you determine the best course of action. Dr. Boles utilizes the LenSx® Laser, the most technologically advanced option for cataract patients today, to create a cataract surgery that’s 100% unique to each patient.